I Hope You Like the Book! As an adjunct faculty member at Kent State University’s School of Library and Information Science, I start each semester by telling students in my Management class that, when I took this course back in the 80’s, the professor began by asking us “Who wants to be a manager?” Only a few of us tentatively raised our hands, fearing the wrath of our peers either because of our ambition or our foolishness at dreaming so big. Everyone else was there because it was a core class. Undeterred, she assured everyone they’d learn something useful in the coming weeks, even if management wasn’t the specific career path they’d chosen. Now, I tell students they’d better all be raising their hands because times have changed and today, as professional librarians, they’ll no longer have the choice to opt out. They’ll all be managing something! Staffing models and organizational charts have changed and are continuing to do so. Driven both by economic reality and modern service expectations, when libraries can fill open positions with MLIS librarians, they’re asking and requiring more professional work than ever before. “In today’s market,” I explain, “if I don’t need you to supervise people or manage a department or budget or facility, then I’m probably just going to hire a para-professional.” Finally, all hands go up! Another sobering reality sinks in around the second class or so. “Between right now and when you start your first day as a manager,” I caution them, “this will probably be the only management education you’re going to get.” One class. Then, maybe a few years will go by. But, maybe not. In libraries around the country, recent grads are finding themselves in positions my contemporaries and I would have expected to spend years working into. Today’s managers are “newer” (I won’t say younger, since that’s not always the case) than ever before. So, where do they turn to learn more? How can they find other opportunities to develop those management skills that are probably as distant as memories of grad school research papers? 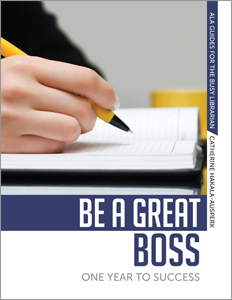 One option is to take themselves through a one-year, self-development course using “Be a Great Boss: One Year to Success.” Written for both brand new managers and ones who’ve not had a training opportunity for some time, my book will help them work at developing the understanding, skills and passion that great bosses need! In most libraries, we send the bosses to training last, right? After we’re sure all our other staff members get the crucial, task or operational education they need to serve the customer? What director wouldn’t admit that her or his management staff, in large part, couldn’t use a refresher course that could get them all on the same, productive, effective page? For the cost of a copy of the book for each manager, entire leadership teams, from the newest to the most experienced members, can gain valuable training and development from the comfort of their own offices by completing this book. Applicants, even those right out of library school, flock to management openings and present great educational backgrounds and high levels of energy. What many of them need is a little more training to go along with that. What most professionals need is on-going learning. After all, we’re all going to be managing something, right?